The New Year is just around the corner! Assuming you’re ready with a failsafe HR strategy for the obvious reasons, attracting, training, nurturing, to retain top talent in your organization is going to be paramount. Let 2017 start a new era for you where you’ll take the driver’s seat to win the best talent out there and retain them for longer. May your HR strategy lead the way in its pursuit with unprecedented pace – May your talent management practices push the limits and break new grounds in your organization. 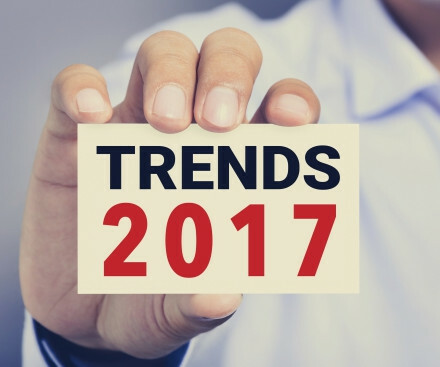 While you’re zooming ahead in reinventing your current HR and talent management practices, here’s quick look at the top 5 HR trends poised to disrupt the HR landscape in 2017 and beyond. Consumerization: A unique term used by Jeanne Meister in her thought-provoking article, “Consumerization Of HR: 10 Trends Companies Will Follow In 2016.” Going by current trends, a home-like experience tops almost every employee’s must-have-in-the-workplace list. However, what most of the employees experience at their workplaces falls far short of their expectations. Consequently, it contributes significantly to the slow but steady rise of disgruntled employees at the workplace. Even in today’s time, most organizations lack any such‘algorithm’that suggests new opportunities (If you like these sorts of assignments, then you will also find an interest in…). This trend, nonetheless, is directly linked to the “Employee Experience.” But a majority of organizations fail to create a positive employee experience consciously for the entire lifecycle of an employee. Performance Consulting:Reinventing employee life cycle from a performance management perspective was high on the HR agenda of a number of organizations in 2016.The trend will not lose steam in thenew year. 2017 is believed to be a year with an increased focus on performance consulting in every major organization. What is ‘performance consulting’? It’s a way to boost people’s performance—to make average employees good and good ones better by giving them relevant feedback and actionable advisory on performance improvement (actionable is the watchword here). So, make sure that it falls clearly within the ambit of your HR strategy for 2017. Networks of Teams—The New Norm: Gone are the days when the focus of HR was completely on individuals. Today, most HR practices consider individual employees as their starting point. If you’re not ahead of the curve, pull up your socks and shift the focus of your HR department to teams from individuals. Remember in new-age HR, managing entire networks of teams, and the method to enhance the way all team members perform,holds the key to success. Collaboration between Man & Machine: Although gender disparity isn’t a forgotten chapter, a new chapter has already been written in modern HR. It’s a new level of collaboration, that too, between man and machine. Yes, this notion of man-machine collaboration is gaining ground in the HR department, slowly but surely. The dawn of artificial intelligence influencing HR to enhance their impact in several areas is breaking. Early birds who tap into it will enjoy a winning edge in the coming future. HR Operations: 2016 has seen the emergence of HR as the strategic business partner. And the trend will continue even in 2017. As projected by industry veterans, HR is expected to add more value to business lines like never before. It’ll probably shoot up the need for a new breed of HR professionals having the ability to take care of the HR departments as any other service organization. Quite unlike 2016, 2017 will belong to HR innovators whose breakthrough practices in HR and talent management will be the new normal, not the exception. Gear up to lead the game by setting new examples in innovative HR practices. Earn HR certifications from a reputed authorityand make 2017 a great year for your HR team, for your people, and most importantly, for your organization!